Last month, I had the opportunity to take an awesome training in yoga for children, families, and communities with Rainbow Kids Yoga. After having had the opportunity to work with some kids, and some kids and their parents, and also exploring more and more partner and group yoga (as well as looking for ways to share yoga with my own child), I was looking for a way to learn more about how to teach yoga to different ages and different groups and found exactly what I was looking for! Salomé and I practicing partner yoga when she was 1 year old :) Kids love yoga! Teaching yoga for kids means helping bring the benefits of yoga - awareness, strength, flexibility and balance in the mind and the body - to kids in a fun way. RKY's approach to teaching yoga to kids encourages play and multi-sensory learning to enable kids to exercise and enjoy while also learning to breathe, focus, and relax. Kids yoga classes might include dance, games, theater, art, acrobatics and other creative elements. And when adults participate in these activities with kids in a family yoga class, they get to wake up their inner child to better connect with their children, strengthening family bonds. Interested? 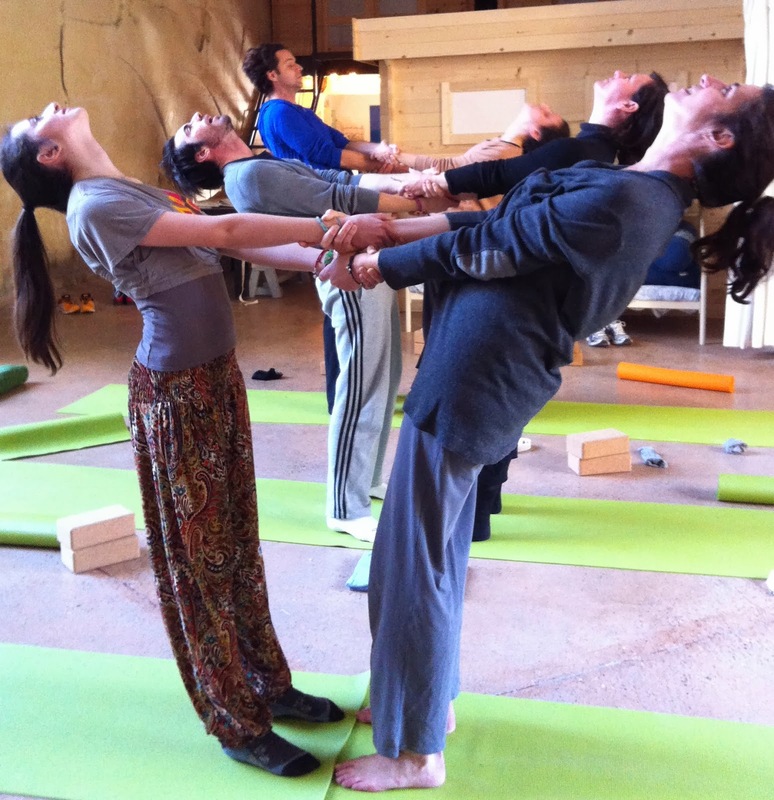 Here are some ways to that your children and your families can enjoy yoga in and around St. Rémy de Provence! Camilla Di Maiolo, creator of Prana Kids yoga and English classes in the Alpilles region, teaches yoga to children in the local preschools, and is now offering kids yoga classes open to the public in St. Rémy, St. Etienne des Grès, Raphèle les Arles, and Saint Martin du Crau. Information on classes is available on her website: www.prana-kids.fr. Book a private yoga session for you and your children, your family, or a group of kids and parents! Classes can be tailored to your childrens' ages and interests. Looking for a fun way to celebrate your child's birthday? Try a yoga birthday party! A themed yoga class for kids or kids and parents is a great way to have fun as a group. And last but not least, join me on Sunday, November 24 for a special FAMILY YOGA afternoon in St. Rémy! Parents and kids of all ages welcome! Contact me for more information on any of these options, and hope to see you on November 24! Fabuleux vacances avec les enfants .. J'aime ce grand partage .. Merci pour partager ce site avec nous .. C'est vraiment quitter intéressants .. Merci pour ce grand post .. I love doing yoga. I am doing since 2010. This really helps me to keep energetic and strong whole day long. also helps to have a sound sleep. I use non slip best yoga socks regularly. For my yoga and I love to wear them the whole day. They have various sizes and designs. You can get open toe, separate toe, and many more styles. Really comfortable to wear and wash. The material is also really good. The best part is they ship worldwide for free and with the return and refund policy.